Have renewed passport – can travel! But in my case, it’s just needed for photographic ID, so that I can fly down to Cambridge for the IAML(UK and Ireland) Annual Study Weekend for music librarians – and whizz back in time for church on Sunday. My choir always does a special evening service on Palm Sunday – and their confidence depends on the final rehearsal after morning worship. You’ll deduce that I simply have to be back in Glasgow in time to play for both services! Having sorted out the passport, I can now book the flights – well, tomorrow, anyway. And tonight I need to finalise and distribute the order of service to all my choir members, so excuse me … I’d better get on with it! This morning I gave my annual lecture about historic Scottish song-books, to the second-year students on the BA Scottish Music course. It was the fourth time I’d given it, but each time it changes a bit. This time I spent quite a long time scanning and inserting musical examples into my paper, and then I had it ring-bound. This totally removed last year’s unseemly scuffling with oodles of sheets of paper and assorted song-books. All I had to do was keep the paper with me, and move from powerpoint to piano from time to time. I had ONE student play a few examples, and I managed to skip bits of the paper when I felt I’d probably said enough about a particular point. So, it was a far slicker presentation, and I wasn’t glued to my “script” all the time. (Quite a bit, but not all!) I remembered to look up and make eye-contact with different students, and I deliberately built in a few questions and challenges, so it was definitely a bit more interactive. My proudest moment, though, was at the end. I had tweeted and then blogged earlier in the week, asking trad singers what they looked out for when selecting songs, and I asked if they ever used old song-books. This was an attempt to find out what was most important to performing musicians, so I could try to relate what I knew, to what they would find interesting. The responses were more about subject-matter than anything, though, and I struggled to think how I was going to get that into my lecture, when I am more concerned with cultural history and aesthetics than with the subject-matter of individual songs. Attempting to mention my “mini-survey” at the beginning of the lecture just wasn’t going to work. However, as I was summing up, inspiration struck. I told the class about my Twitter survey, and the results. Then I admitted that I couldn’t tell them which songs had those characteristics (poignant, memorable, featuring strong women or dramatic events), but that I was absolutely sure they’d find such materials in the old song-books I’d been telling them about – so I strongly advised them to go and explore the repertoire. I must admit I was pleased I’d thought of this on the spur of the moment. It meant that in summing up, I’d managed to relate my subject-matter with their interest as performers. 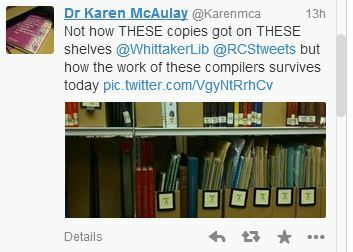 Besides posting my bibliography and powerpoint on Mahara, I shared them – and the paper itself – with the course-leader, but I couldn’t resist a follow-up blogpost on Whittaker Live, as well. I think it’s quite important to let folks know what I’m up to, and how I try to get public engagement with my work.